This was remarkable. Just remarkable. Athol Dickson's writing credentials are impeccable, and one need only read Lost Mission to discover why. Painstakingly researched and masterfully told, the story bookends lives separated by 200 years in time, but intertwined in eternity. In 1767, Fray Alejandro left his Franciscan monastery in Italy in response to a call to minister to the heathen natives of New Spain. Adventures and misadventures befall the holy man as he strives to establish La Misión de Santa Delores in Alta California with his abbot, Fray Guillermo, and brother priest, Fray Benico. All three padres are forever changed in their endeavor. Fray Alejandro bequeaths an unlikely legacy that changes the lives of all who behold it. Especially four lives in our present day. Lupe de la Garza of Rincón de Delores, home village to Fray Alejandro in his final days, senses a similar call to witness the Gospel to the lost Americanos north of the border. Carrying Fray Alejandro's legacy in a cloth sack, Lupe sets off on her mission. Enter Ramón Rodriguez, on a quest to earn money for his family and his dream back in Mexico, who leads her into the desert wilderness over the border only then to lose her. Discovered and saved by newly ordained Tucker Rue, himself seeking divine guidance in the solitude of the desert, Lupe joins him in his ministry to the Latinos of Wilson City. Seeking to renew her call to preach to the Americanos, Lupe leaves Tucker's ministry and ends up in the employ of the rich and powerful Delano Wright. The stage is now set. The lives and fortunes of these four people, who couldn't be farther apart on the spiritual and socio-economic spectrums, become inextricably enmeshed--glued fast by Alejandro's legacy and a mysterious figure who himself spans the centuries. Faith and principle collide with temptation and human weakness with predictable results. Well, maybe not so predictable. The story reaches its climax when the dormant and lethal specter of the long-lost Misión de Santa Delores arises and engulfs modern-day Alta California as it did in Fray Alejandro's day. Redemption is granted, restitution is exacted, and nothing is left to fate. There are many lessons we learn from Mr. Dickson’s skillful pen, perhaps the most notable being that the consequences of our actions, words and even thoughts—good and bad—affect not only our own lives, but the lives of those around us. And yes, even of those who come ages after us, those whom we will never meet this side of eternity. This is simply a must read for both the story and the storytelling. Like an intricate and costly tapestry, the storyline is illuminated and enhanced by a frame of extraordinary prose. It isn't just a great read, it's an emotional, intellectual and spiritual investment. 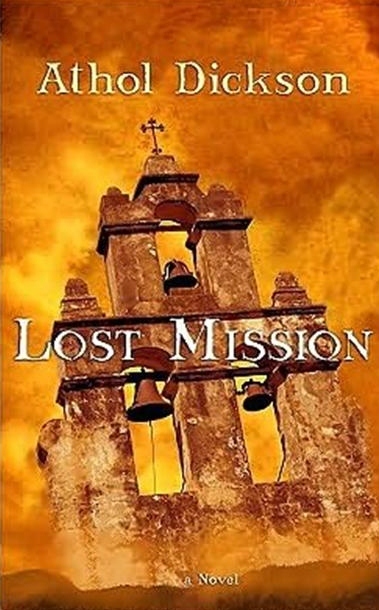 Less than halfway through Lost Mission, I ordered two more of Mr. Dickson's books. You'll be seeing his name again on this blog.